In Out of Africa, after listening to a beautifully spun story, Denys Finch Hatton asks Baroness Karen von Blixen if she has traveled to the places in her tale. Regretfully, she admits that until her purchase of a farm in the Ngong Hills of Africa, she had been only an armchair traveler. Wandering exploration and travel by armchair are two very different things. But we cannot label one as better than the other for science proves that escape within something enjoyed, especially books, brings a great relief of stress, moving one beyond the day-to-day components of life. But oh, the joy of real travel! There is something glorious in the discovery of a new place –and there is the knowledge that when one returns home, they are somehow changed for the better. Just as a student’s growth is visible to the knowing eye of the teacher when they return from summer vacation, others notice the change in a friend who returns from sabbatical. Travel gives birth to new thoughts, and reflections on memories perhaps otherwise forgotten; moreover it fosters creativity. In seeing more, we become more; in experiencing another culture, our souls stretch and grow. Moving beyond the steadfastness of our present lives, we once again recognize that we are more than our profession, more than a parent, someone’s child, or sibling. The images we retain from a meaningful trip are colored by the emotions we experience when traveling. 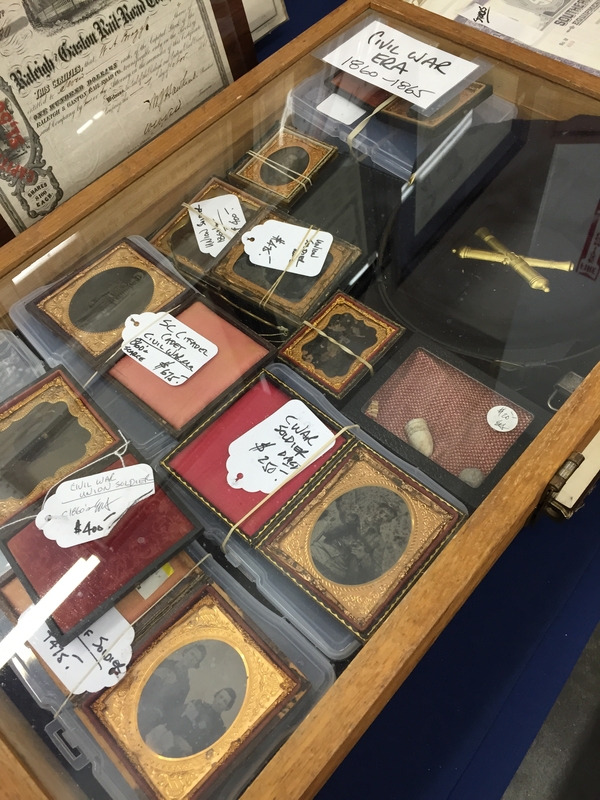 While we cannot possibly recollect it all in great detail, we bring back with us snippets, souvenirs of sorts –be it an appreciated object, purchased or found; notes on a napkin or postcard; photographs. Then when the time between travels grows too long, we seek out the objects that they might transplant us to that special place again. Go~ make plans, fill the heart with anticipation! There are chaotic days. There are boring days. And then, there are road trip days! 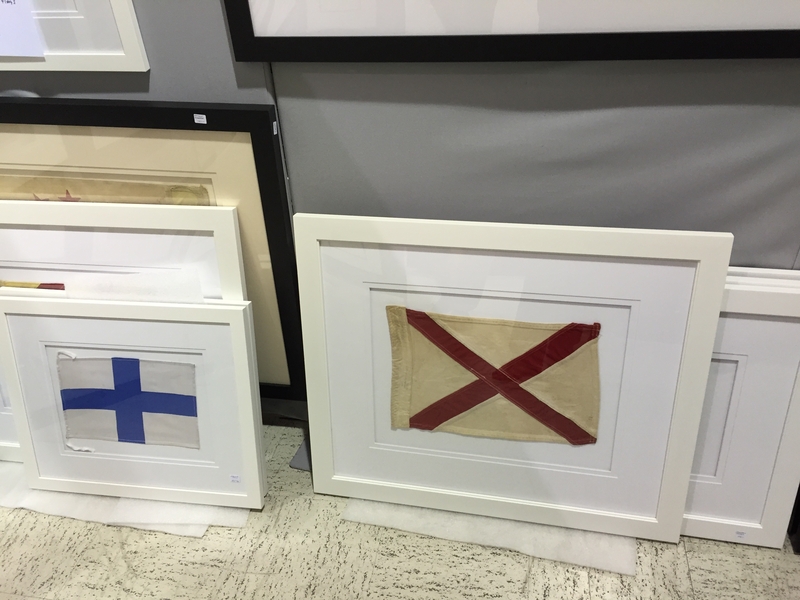 So, when the promise of hours spent riffling through antiques in Atlanta, Georgia was waved beneath my nose like a tasty morsel, I took the bait, completely! At forty-eight I still don’t know my way around the city. It is one thing to set out on foot around town with a general idea of where you’re heading; it is entirely another to navigate around Georgia’s capital city, dodging idiots and taking back-roads to avoid road construction. Needless to say, I laud the finesse of my driver. Not only was it hot as hell in Atlanta this fine July day, the traffic was unbelievable. 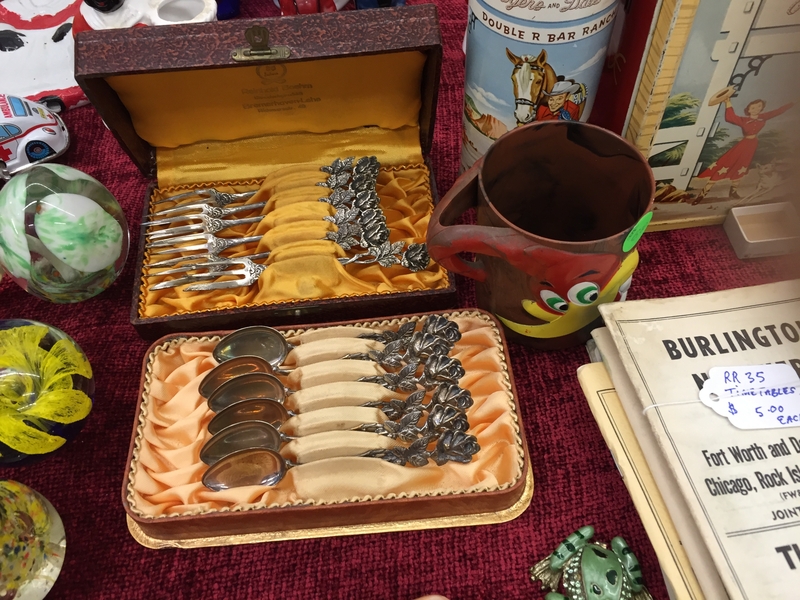 I think for me the love of rummaging through old things began as a child. Clearly I remember slinking away to my GrandMosie’s back bedroom to pull out her collection of Sarah Coventry jewelry. It was the same in her closets –and thus began my love of vintage clothing. She didn’t do away with anything. My cousins and I tried on her dresses from the 30’s and 40’s and fought over her pointy crocodile pumps. 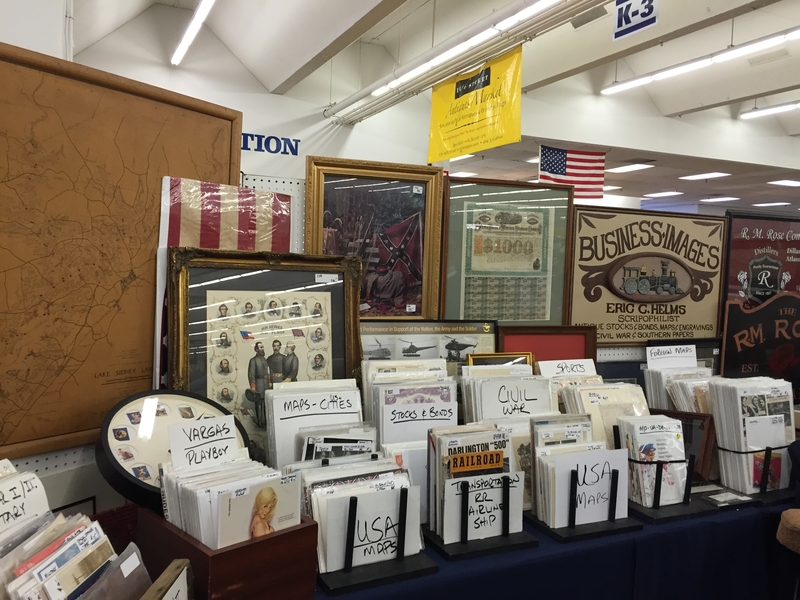 Another layer was added to my obsession when I began attending antique auctions with my parents. Here, I fell hard for furniture. 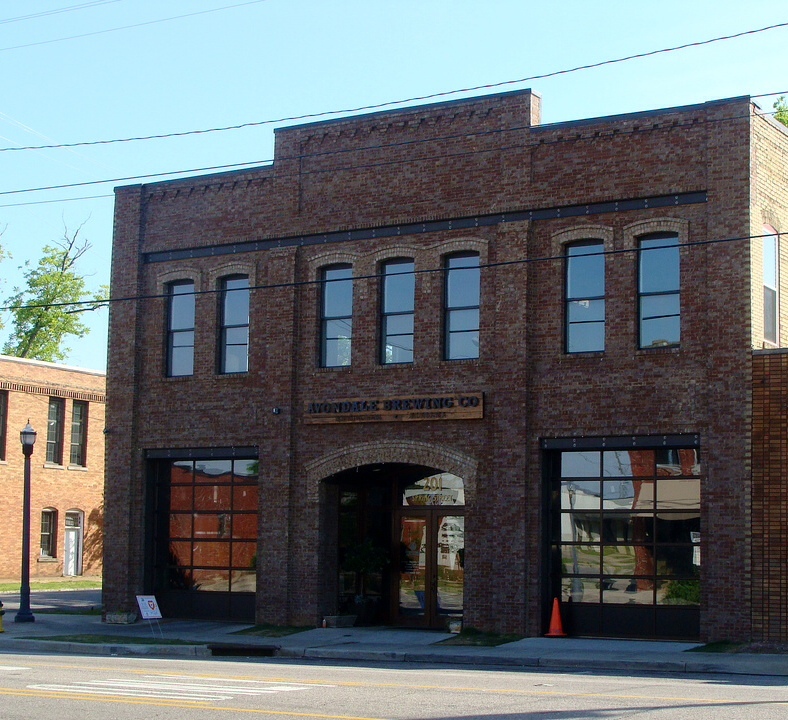 A summer or so later, my sister, Suzanne introduced me to a salvage store in Cullman, Alabama –Southern Accents Architectural Antiques. Forever since, I’ve been owned by this infatuation with all things rusted, antiquated, collected! Today’s destination promised to feed these passions, well. 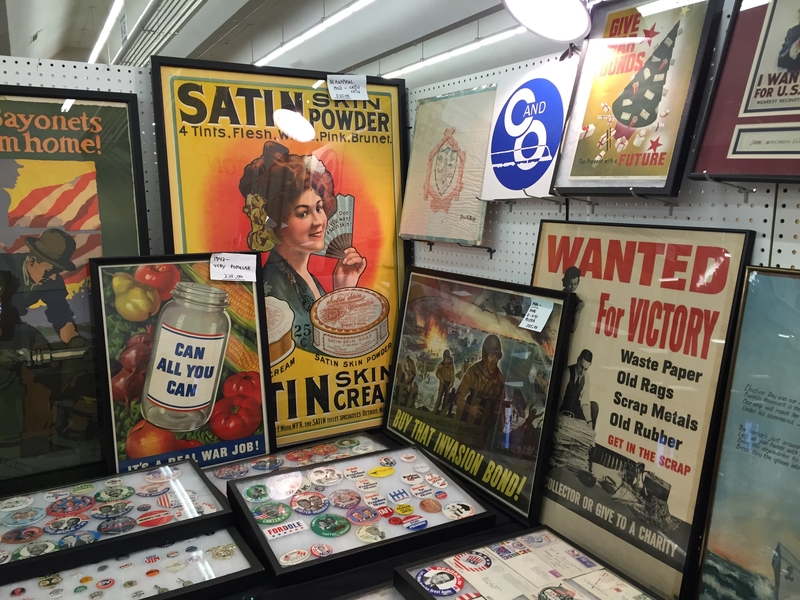 Without scratch dent or even a bump, we arrived intact at Scott Antique Markets. Mind the (s) in markets, as there are two! 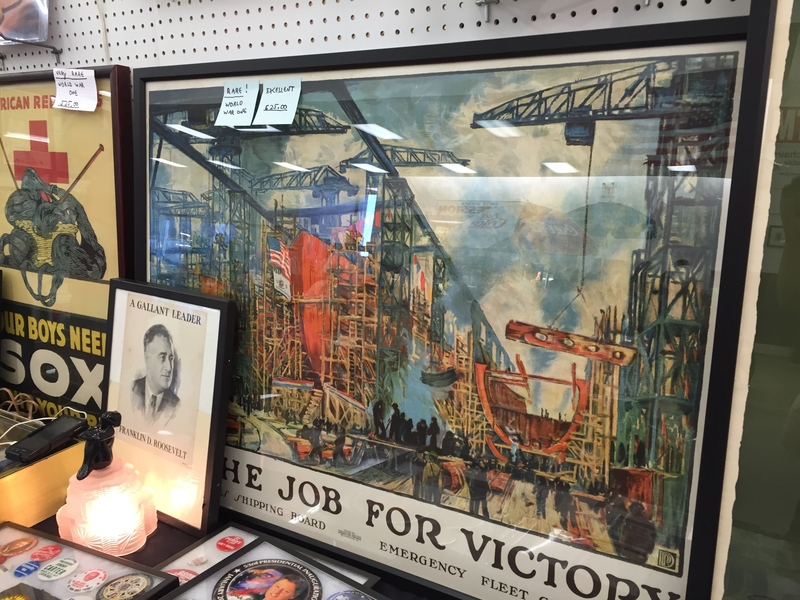 The antique show is held the second weekend of each month. 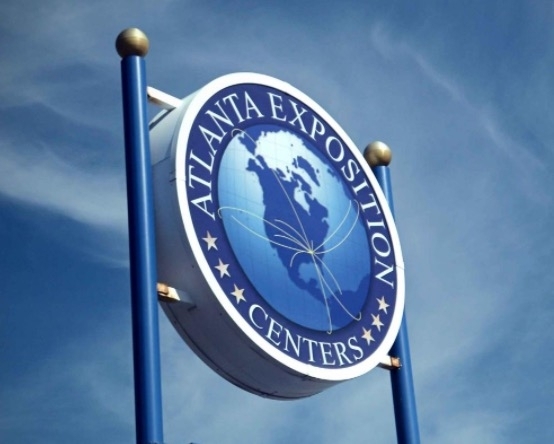 Admission is $5 and tickets are good for the entire weekend. I admit I cheated and checked out the website prior to our trip. 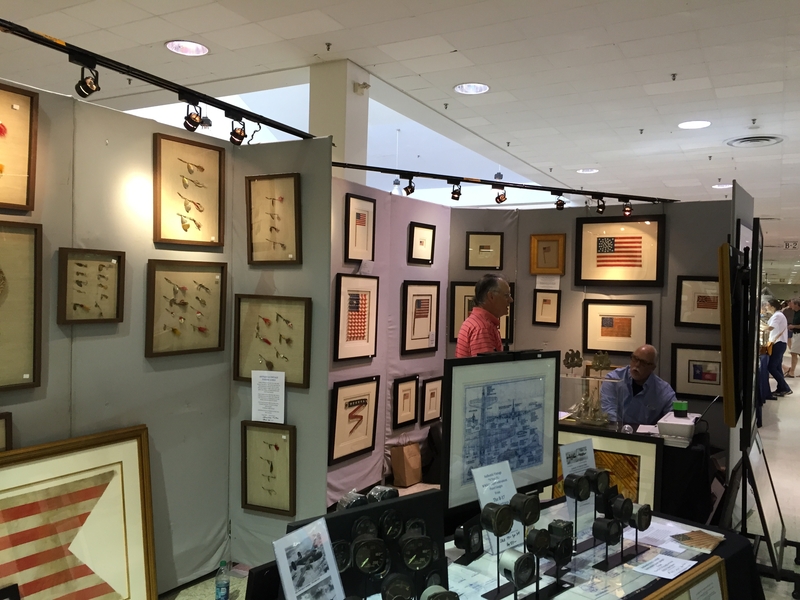 It boasts that it is the “World’s Largest Monthly Indoor Antique Show”, with over 3,500 booths filled with antiques and collectibles. I couldn’t wait to wander around and get thoroughly lost! 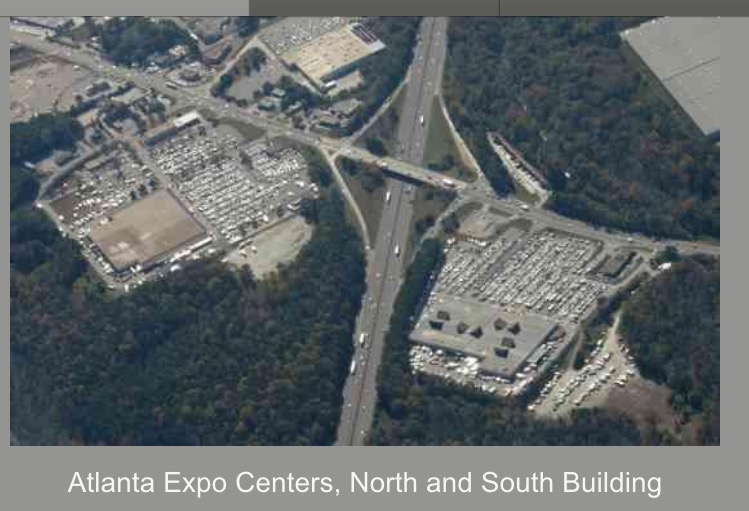 The North Building is located at 3650 Jonesboro Rd; 3850 Jonesboro Rd, Atlanta, Georgia is the address of the South Building. 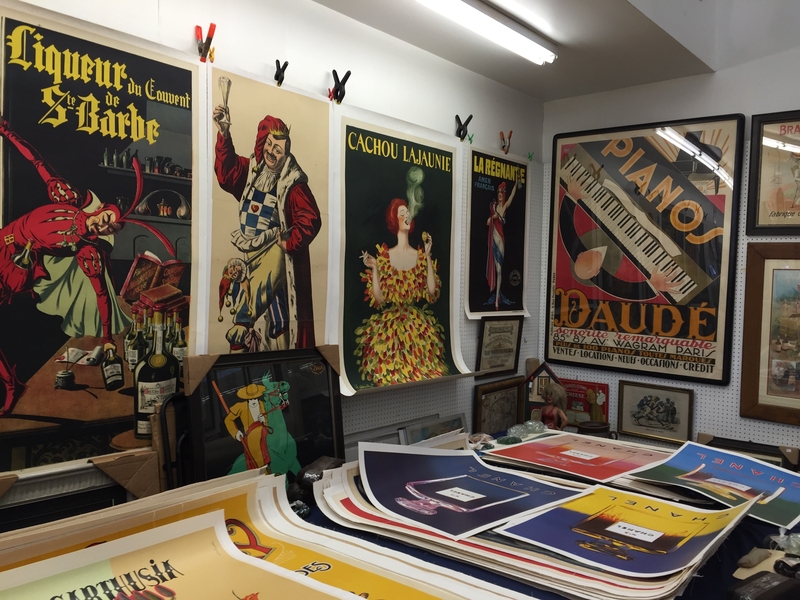 French posters and other poster art are a strange love. I just can’t get enough of them! 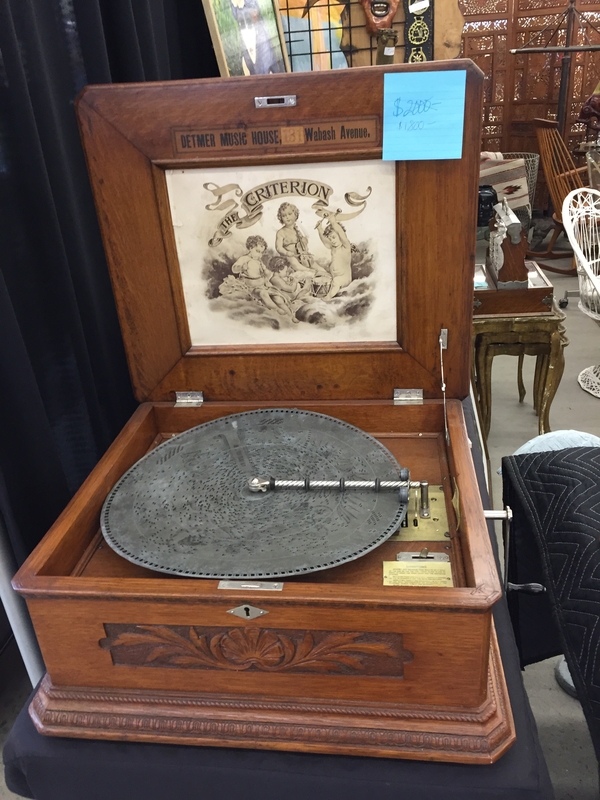 A gorgeous disc music box marked, The Detmer Music House. The sound was incredibly clear. 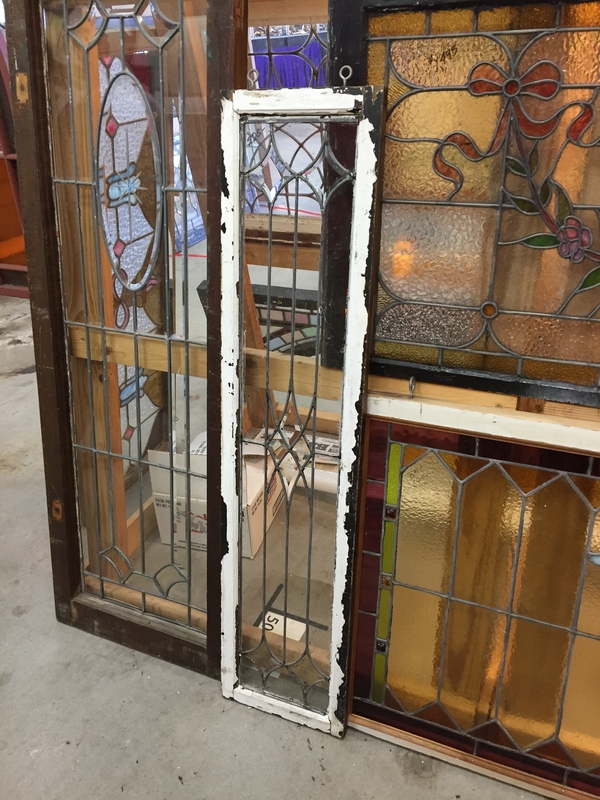 An entire section of nothing but stained-glass windows that made me want to purchase an old home to renovate. 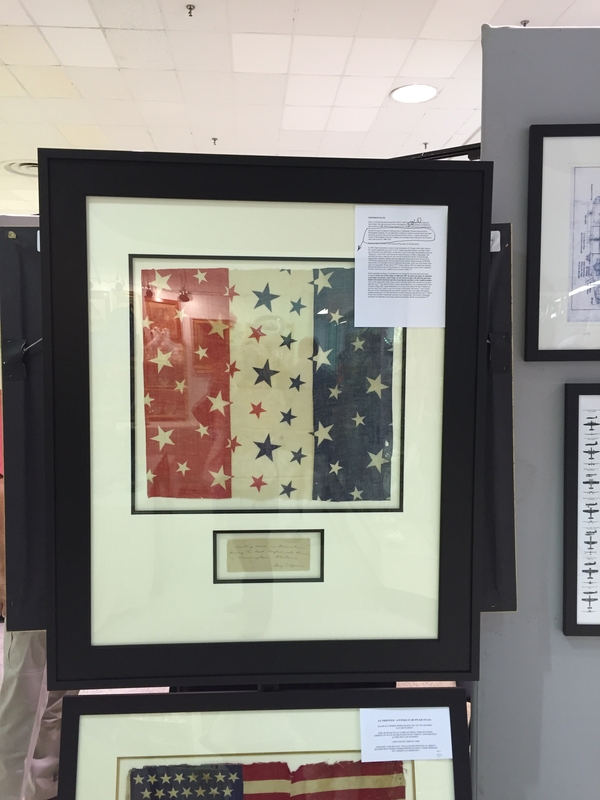 More of the same in Civil War memorabilia. I would never get my Papa out of this booth. And antique fishing lures! Literally there is something for everyone. You could come with twenty people, head in different directions upon entering and never cross paths. 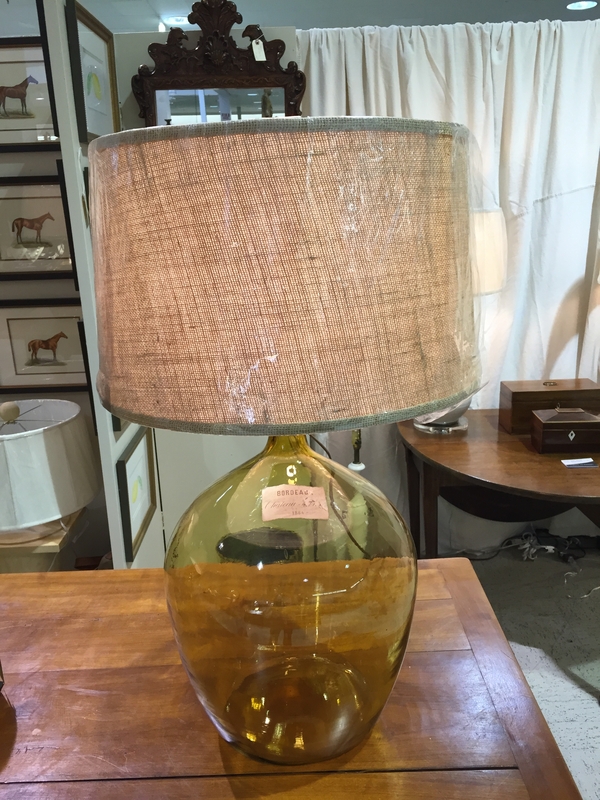 These gorgeous demijohns made into lamps were incredible, so large and rich in color. Italians know it is a sin to store wine in anything other than glass. In Italy, demijohns are passed down from family to family; and they still fill them annually with their favorite local wines. I can’t believe I didn’t get a photo of the chandelier I fell hard for.The only negative thing about being a window shopper is not purchasing. I always recognize what I should’ve bought by the time I return home. 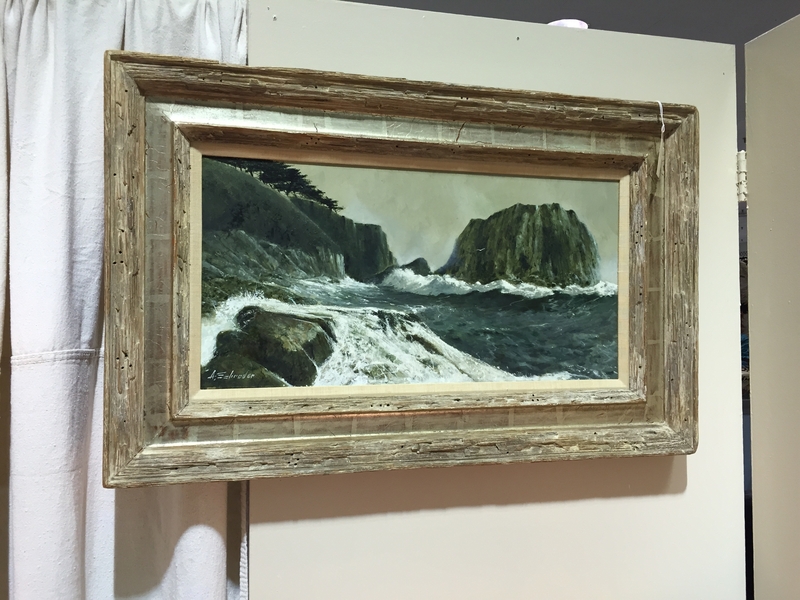 The etched water glasses and a seascape painting with a rough, hewn wooden frame were sure purchases. 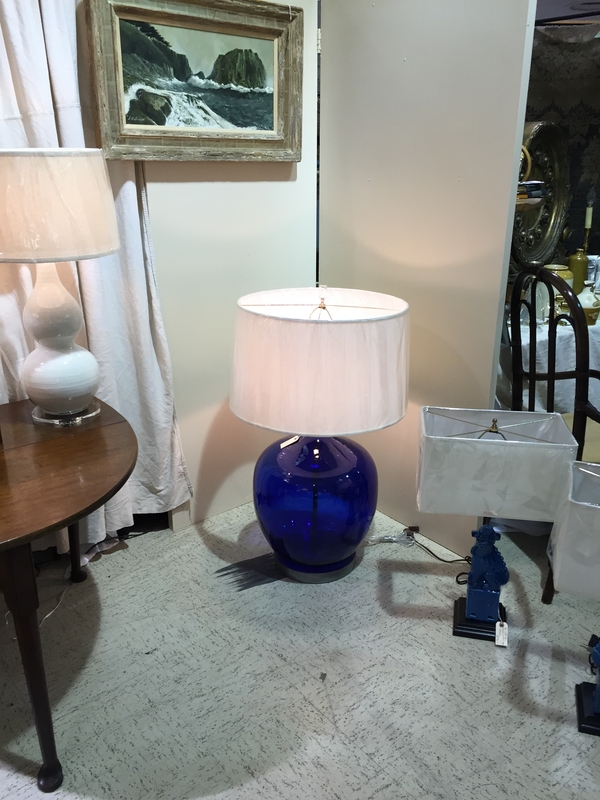 …Until we arrived at 1811 Piedmont Ave! And then, one addiction was followed by yet another! 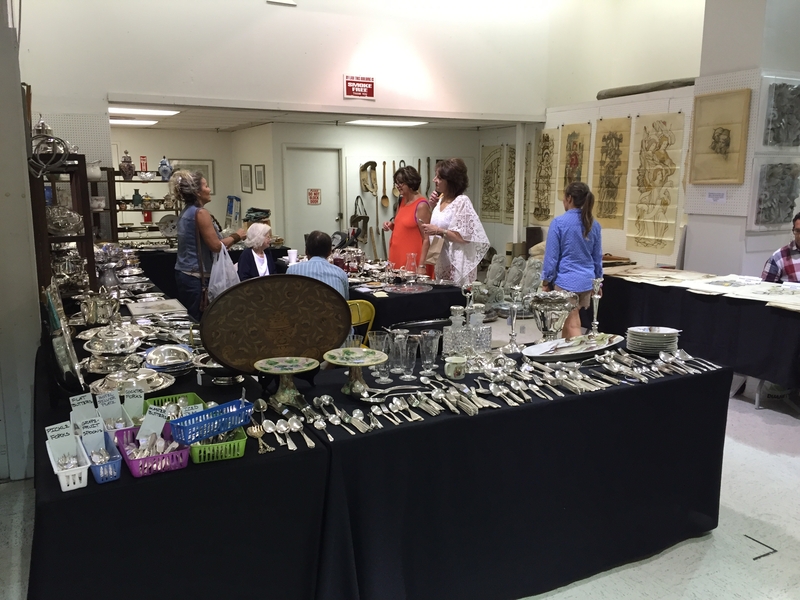 I’d known in advance that we were going rummaging through piles of antiques in conditioned air. 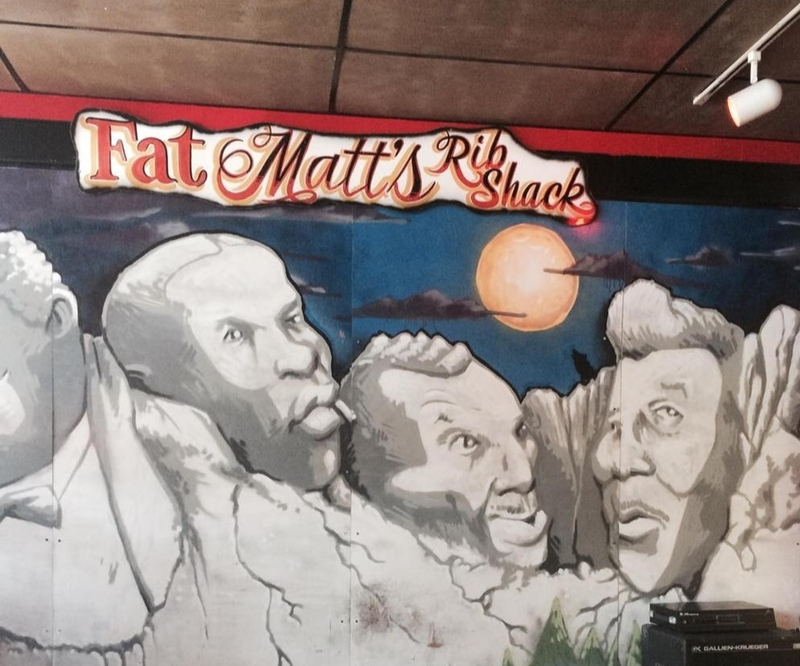 A late lunch at Fat Matt’s Rib Shack, however, was a sweet surprise! We arrived to find the line had not yet snaked its way around the building -or if it had, we’d luckily missed it! Opening the door, we were immediately met by cold air and the lingering, seductive smells of Southern food; above the hum and drone of those feasting, Sam Cooke crooned. I felt I had truly died and gone to heaven. The ribs were indescribably good. We ordered ½ a slab –it and the sides combined were more than I could handle. The meat fell from the bone and I don’t even think I touched the extra sauce they sent out! 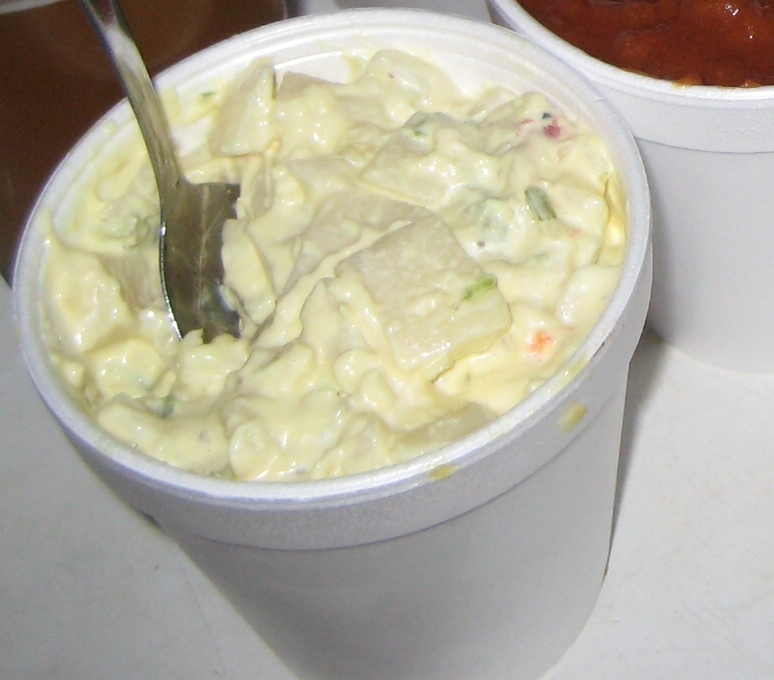 And, the potato salad…I’d drive the two hours from Oxford, Alabama for it alone. We also ordered the Rum Baked Beans –they were divine as well. I looked long and hard at the mac n cheese -the South’s favorite vegetable. I also cast a wanting eye toward the collard greens; Lord knows I longed for them both. But does this not make a second visit in the very near future necessary?! Perhaps next time I’ll brave an evening visit for the live Blues! *Due to severe cravings and BBQ withdrawals, this is a very delayed post. Please forgive! 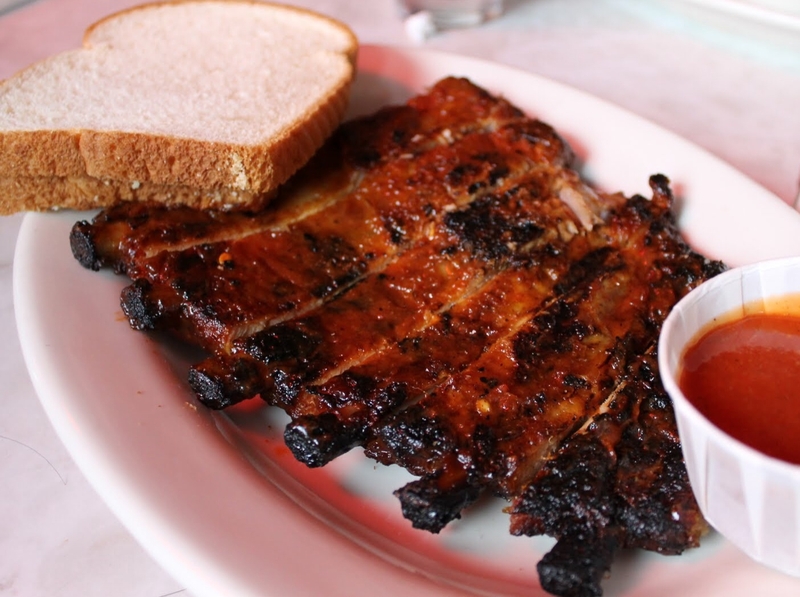 All I know is that I craved those ribs for two days after the fact and found it impossible to write about them; every time I made the attempt, I had to stop and find something lackluster to eat from the kitchen. There is a certain thrill that comes in experiencing the unexpected, visiting the unknown. Perhaps we are born with a yearning to explore new places. Once fed, the hunger to roam becomes more urgent, as almost unwittingly there is the construction of a new appetite. I have this appetite. Although my mantra is any road trip is a good road trip I was not overly intrigued by the idea of visiting Selma, Alabama. I was, however, motivated by the possibility of any unforeseeable events that may lay in store along the way. Our little group had agreed to meet up early that Wednesday. There before the others, I remember parking and looking about, wondering if in fact our vehicles would be the first in any parking lot on JSU’s campus. Jacksonville seemed eerily silent before sunrise. Leaning against the car, I sipped my coffee and enjoyed the solitude, knowing it very well could be the only quiet moment of the day. Admittedly, I was anxious. This was the first time I’d ever ventured off with a group of folks I did not know and although I fought against it, my mind kept whispering trapped in a car for a long period of time. One by one they began to arrive. Quickly I slid in behind our driver for the day –a highly intelligent, unpredictable, fun-loving fellow who also happened to be our Southern History Professor, Dr. Harvey Hardaway Jackson III. The remaining crew consisted of three female students all of whom I’d already labeled as “talkers”. For this I was exceedingly grateful as I tend to be overly quiet around folks I don’t know. Hardy –forgive the informality, but many years have now passed and the friendship is surely sealed, forever tight –Hardy had offered up an open invitation in class that anyone who cared to join him should, as he was scheduled to speak at the Selma Public Library regarding his latest book Inside Alabama: A Personal History of My State. Dog-eared copy in hand, I was the first to sign up. Once on the road, we fell naturally into the previous day’s discussion on why it is we Southerners think and act as we do. I can honestly admit that prior to his classes, I’d never paused to question such things. Before we knew it we were nearing Montgomery. Hardy detoured through Lowndesboro, explaining it was “not so much a town as a string of historic buildings”. The 2000 census placed the population at 140. As we followed the route taken on the Selma to Montgomery march of 1965, he explained that it was just outside of Lowndesboro that Viola Liuzzo, a young civil rights activist from Michigan was chased down by the KKK and shot. Liuzzo was driving Leroy Moton, who had recently participated in the second march, to the airport. Hardy eased the car off the road, stopping at an old white church. It immediately reminded me of the Baptist Church my grandparents had attended when I was a child. Oh, how many sweltering summers my cousins and I spent in those small back Sunday school classrooms, making crafts, memorizing Bible verses and sweating bullets during Vacation Bible School. As he parked, Hardy gave us a brief summary on the Christian Methodist Episcopal Church, formerly the Colored Methodist Episcopal Church. 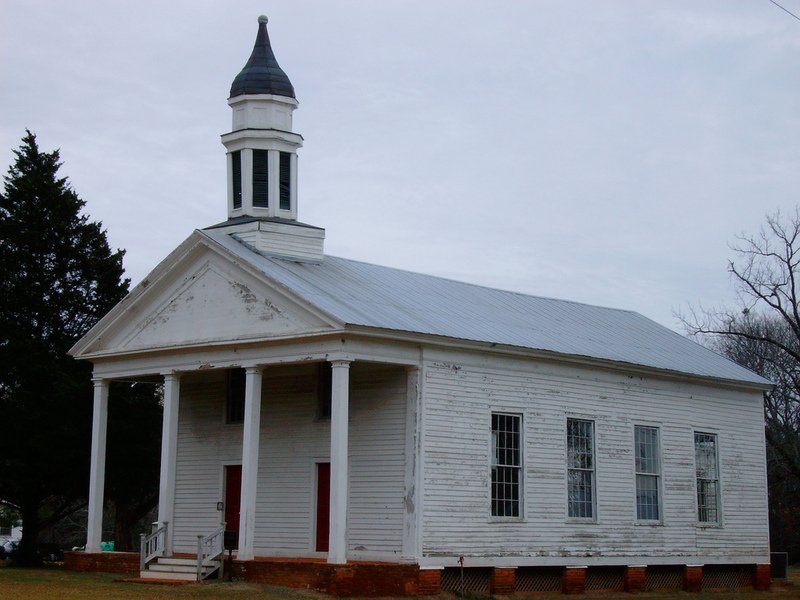 Built in 1830, the structure is capped with the dome from the 1820 Alabama Statehouse in Cahaba. After walking around and taking a few photos, we loaded back up and headed to our next stop. St. Paul’s Episcopal Church was built in 1857 from a popular pattern found in a book by Richard Upjohn. 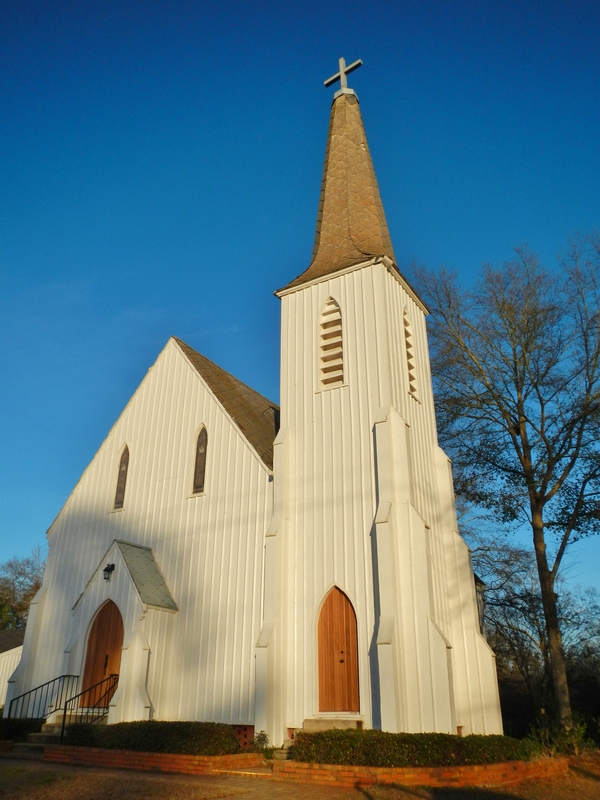 The Episcopal church in Jacksonville, AL was based on the same plan. “You usually find Episcopal churches in settlements where wealthy planters from South Carolina and Georgia settled,” he further explained. 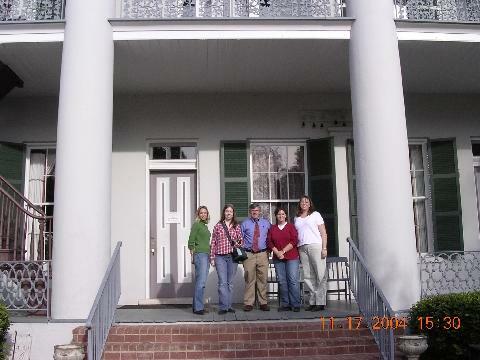 Our last stop before making our destination was Sturdivant Hall. 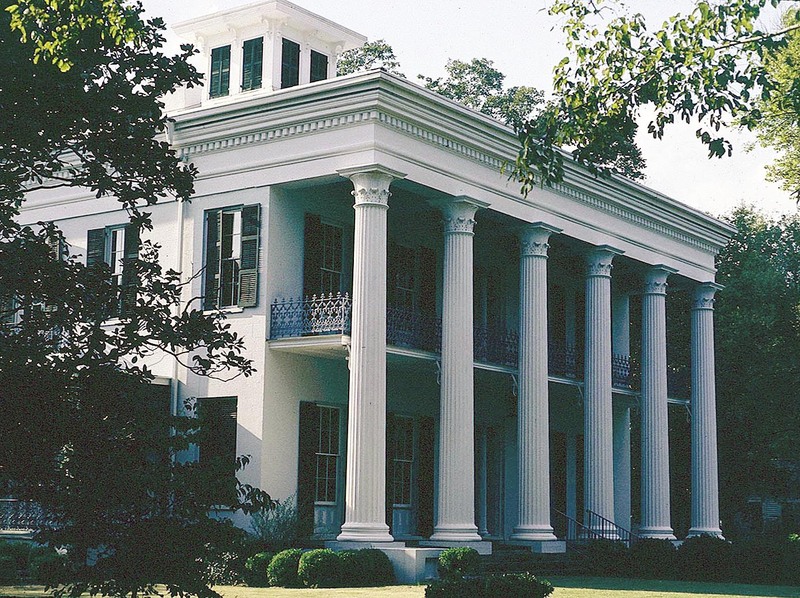 Built in 1852-1856 as a townhouse for Colonel Edward Watts, the Greek Revival neo-classical architecture is breathtakingly beautiful. Hardy walked us through the house, discussing various objects and artwork. A woman nearby explained that workers were brought in from Italy to complete the plaster and marble. 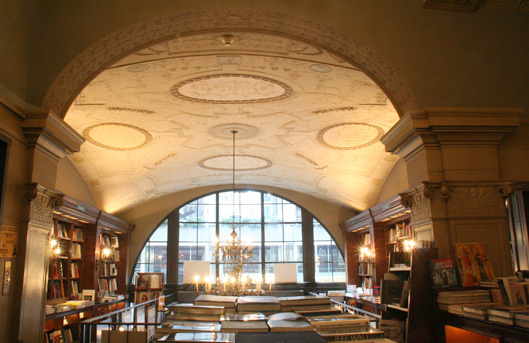 Never did she whisper that the house is allegedly haunted by former owner and banker, John Parkman. Before leaving, we all gathered in close for a photo. 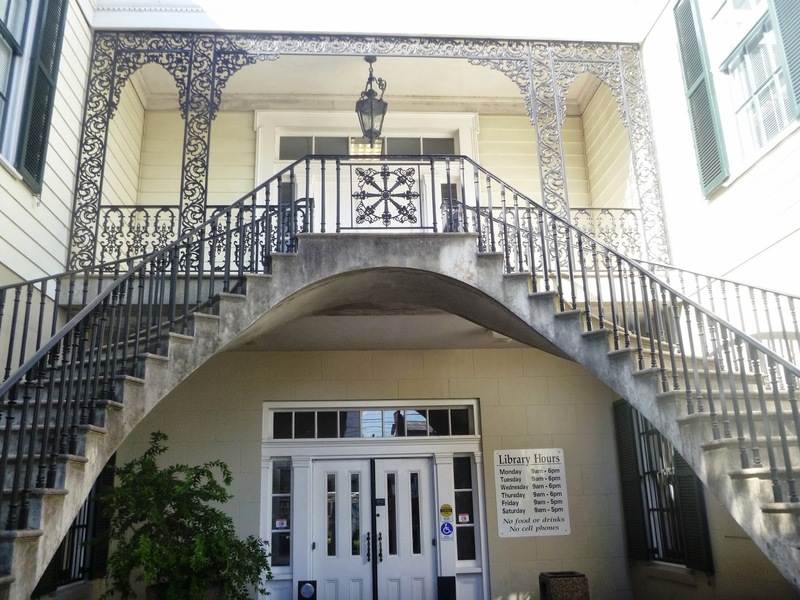 By the time we reached Selma Public Library, I already felt as though the trip had been worthwhile. While Hardy was busy socializing, the girls and I all went our separate ways. Longing for a quiet moment, I walked around the library admiring the paintings. From the corner of my eye, I noticed an older lady had come to stand close by. There was an ease to her that I still cannot describe; she too seemed caught up in the combination of beauty and quiet separateness. “Sunflowers are the most beautiful flowers, don’t you think?” she asked admiringly, indicating a nearby painting. I recognized the softness of her Southern drawl. She noted the difference in mine as well and as we wandered along she inquired as to which part of North Alabama I was from. She asked if I gardened and we chatted about growing up in the South. 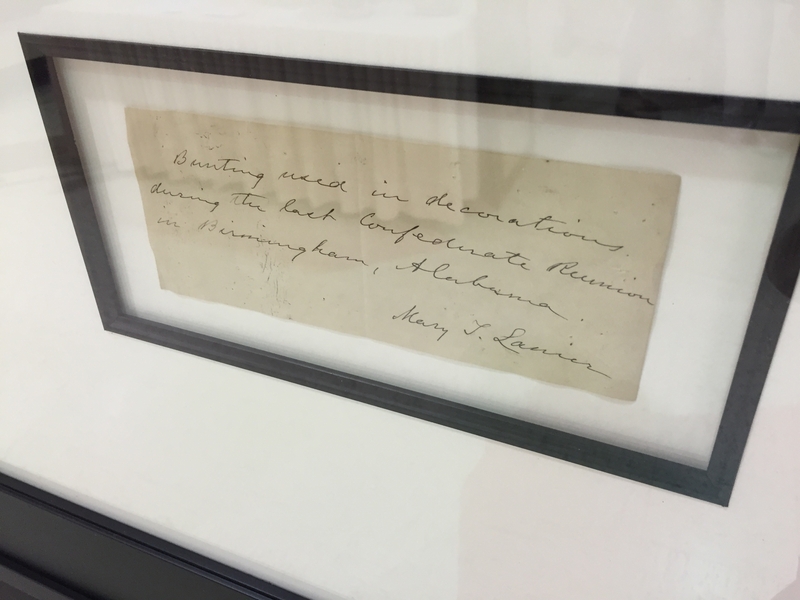 The sound of her voice was lulling, soothing and it was with disappointment that I realized we had arrived in the area where Hardy was to speak. Although I was looking forward to listening to my professor’s tales of the South, I was disappointed that my time with her had ended. As we took our places, she slid in beside me and another girl from our group. I smiled, pleased that she was joining us and realized with a start, I’d not asked her name nor introduced myself. I happened to look beyond her to my fellow traveler whose eyes were now weirdly wide. What the hell is she doing, I wondered. She mouthed Kathryn…Tucker…Windham, nodding at the woman I’d been chatting with. Suddenly I understood the peculiar expression on her face. The knowledge was devastating, as if I had been hit full in the chest with a crowbar. I’d been wandering about, passing the time with my favorite childhood author and had not even known. Mrs. Windham had surely been saved from much gushing and stammering. 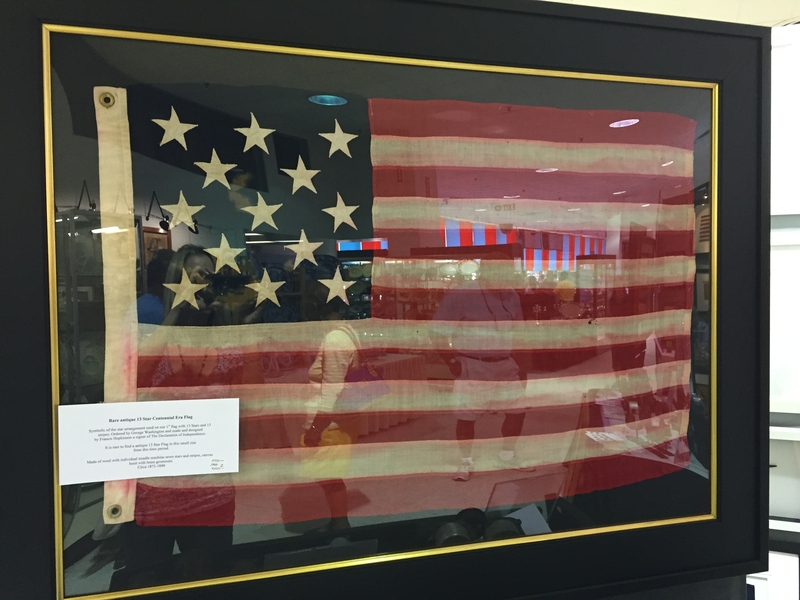 Feeling equally blessed, I sat and listened as Hardy recounted family tales of courage, feuds, Good Ole Boy politics, his daddy’s poutin’ house, Southern chivalry that was not dead, and all the glorious things that had once separated Southern culture from that of the remaining nation. I listened to Hardy, but could not keep my eyes and thoughts from Mrs. Windham. Had the chance, lost it, kept running through my mind. With his talk completed, Hardy walked about shaking hands and hugging necks. I noted that the majority of the audience was indeed female. This garnered a well-deserved smirk; smart man, when he caught my eye, he knew exactly what it meant. 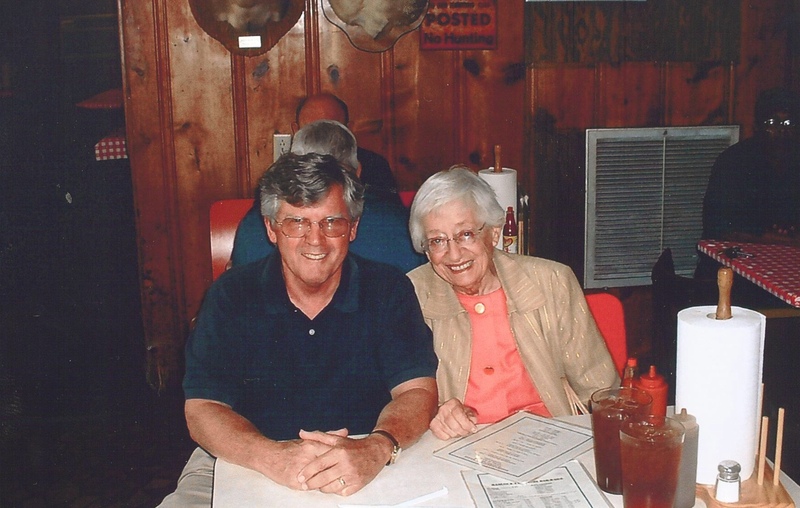 Mrs. Windham joined us for a moment before we left and I learned that she and Hardy were ‘cousins-in-law’. Before heading north, we made one more stop at Old Live Oak Cemetery. If only the wisteria had been in bloom, large white magnolia blossoms scenting humid air. Though these were not yet visible, we Southerners knew they were there and could smell them just the same. “There is glory in the graves” read the inscription on a nearby Confederate monument. 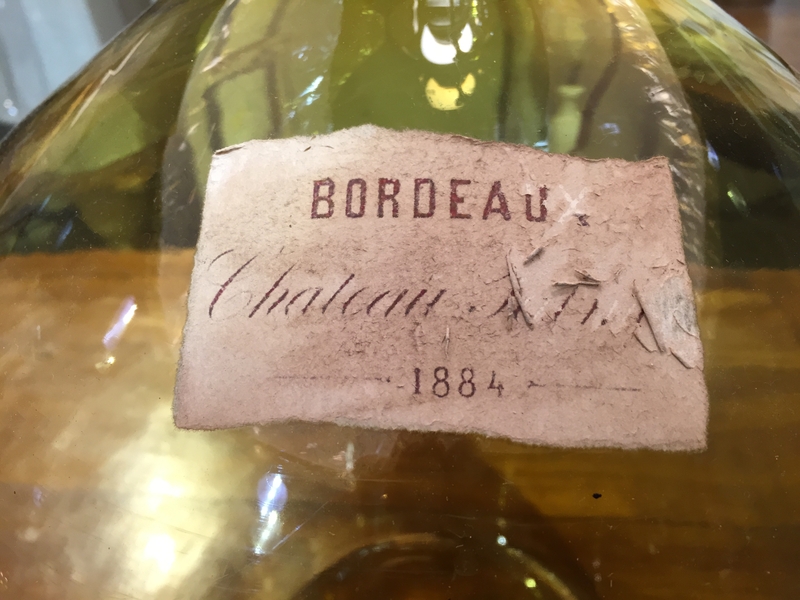 In 1879 Colonial N.H.R. 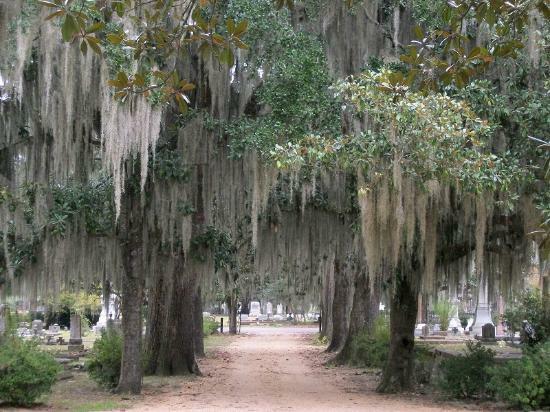 Dawson purchased eighty Live Oaks and eighty Magnolia trees in Mobile, Alabama and had them planted throughout the cemetery. Spanish moss drapes down from ancient oaks as if trying to enshroud the chivalrous dead; their cannons, still close at hand, aim northward. I rode to South Alabama with one storyteller, and ended up meeting another. It was a charmed meeting. 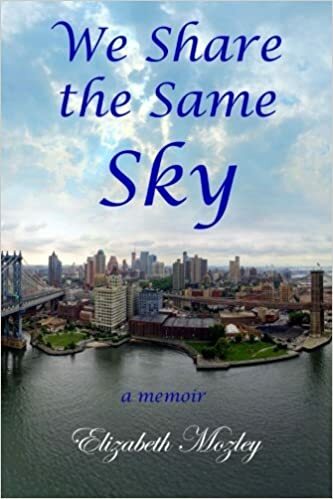 But, as we made the return trip, I couldn’t help but feel that I’d been cheated –I’d have asked about her favorite memories, the foods she longed for when she was with family… With a slow smile I realized exactly why she had skipped the introductions. Was it not so much more to wander, admire the beauty before us together and speak gently, proudly of our South? 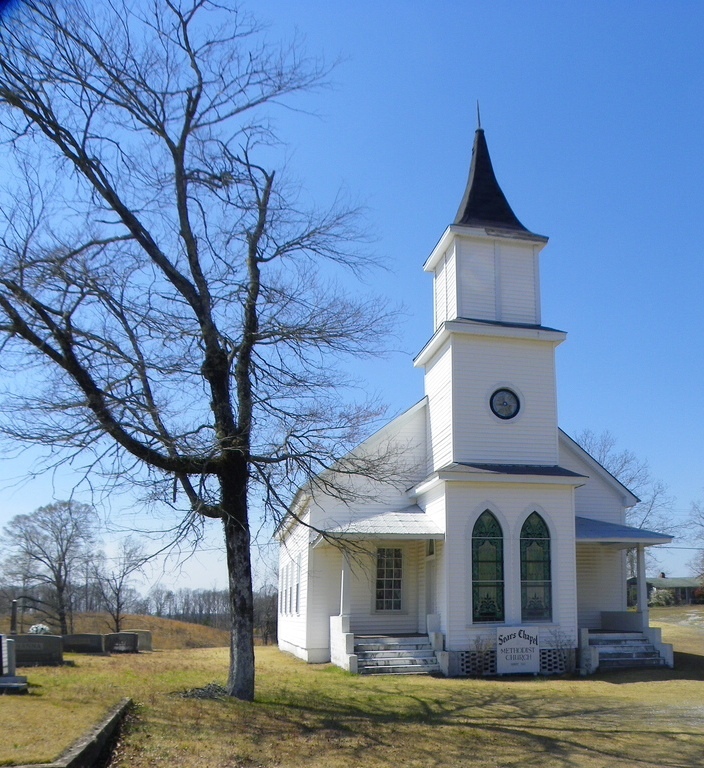 On 231, just north of Rockford, Alabama we passed Sears Chapel Methodist Church. Hardy slowed the car and we lowered the windows. I imagine each and every one of us held our breath, thought of Mrs. Windham and her love of ghosts and listened for the baby crying in the road. It had indeed been a road trip to remember. Looking back, I am reminded how quickly a moment can pass and how we do not know the moment for what it is until much later. That trip was a catalyst that sent me down another road; a conglomeration of memorable moments those two years with Hardy have become. They are firmly cemented as well. While meeting Mrs. Windham was a true gift, it was the tutelage of Dr. Hardy Jackson that took my life in an unexpected and better direction. How often the unexpected moments become the focal point, rather than the destination. Sometimes you set out on a jaunt, and bring back a little more than you anticipated. Dr. Harvey Hardaway Jackson III. Inside Alabama: A Personal History Of My State (2004). 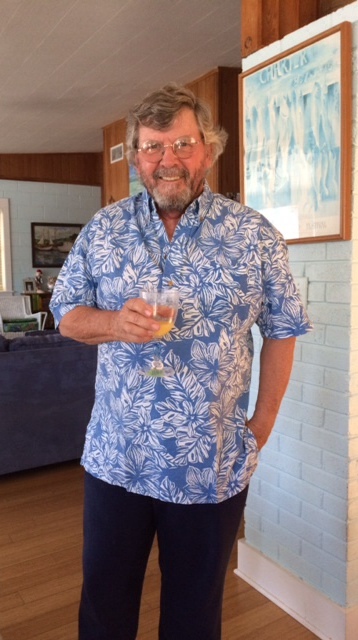 Hardy also authors the column “Gone South” for the Anniston Star and serves on the Editorial Boards of The Alabama Review and The Gulf South Historical Review. 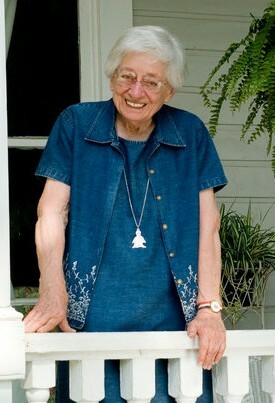 Mrs. Windham was a reporter for Alabama Journal, The Birmingham News and later the Selma-Times Journal where she won Associated Press awards for photography and writing. Mrs. Windham also performed her stories on National Public Radio’s All Things Considered and Alabama Public Radio’s Alabama Life. 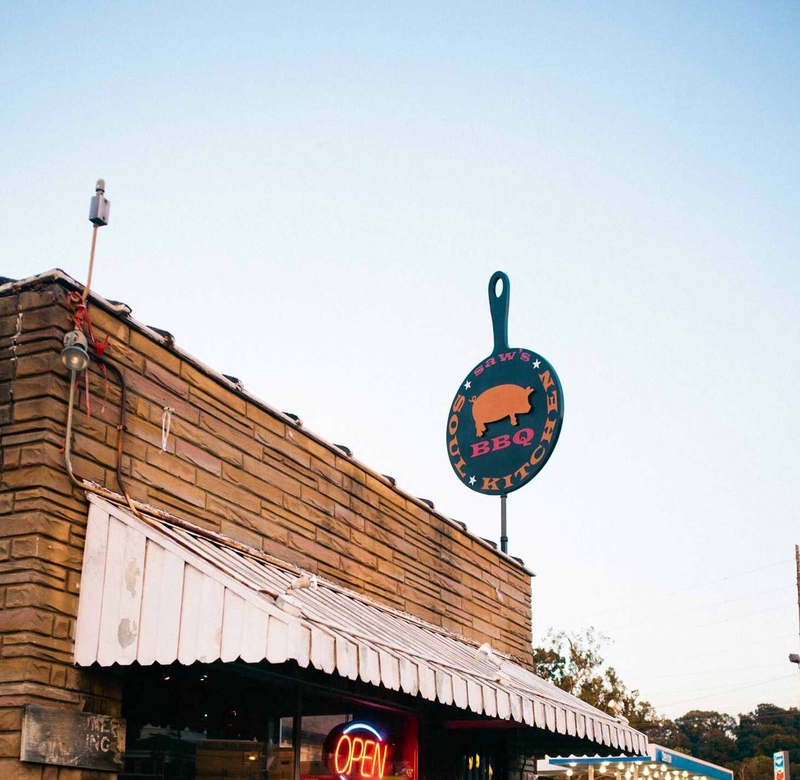 This past week when the rain slacked off and the skies cleared, friends and I hit the road heading west to Birmingham, Alabama to try the BBQ at SAW’S Soul Kitchen in Avondale. Why, you ask? It’s simple. 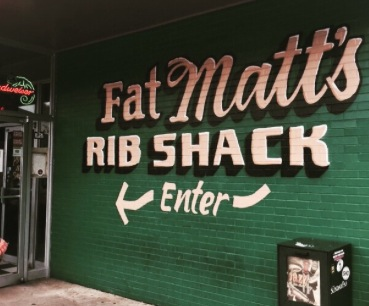 2 Reasons -this tiny hole in the wall joint has smoked meats, seafood and soul food that is lauded, loudly! 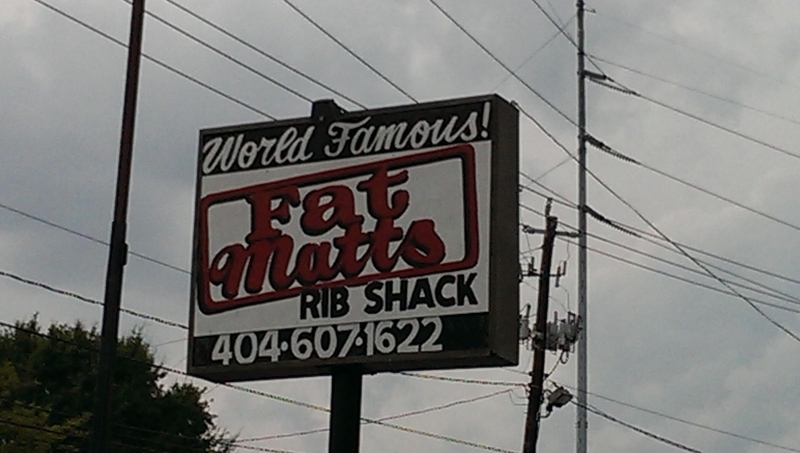 And, the one little block where this soul food haven is located is a loaded little block. It has it ALL. 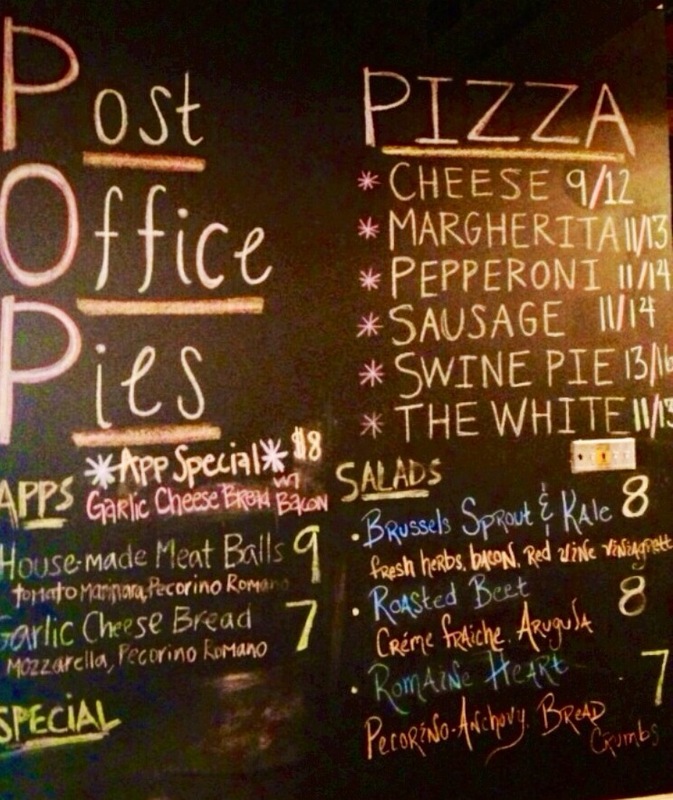 From one corner to the other you have, elbow-to-elbow: SAW’S Soul Kitchen, Post Office Pies & Avondale Brewery. Another hop skip and a jump and you’re at Good People Brewing Company, a favorite I will elaborate on in a later post. By the time my friends and I arrive, the rain has let up, the sun is out and it is deceptively warm in the car. 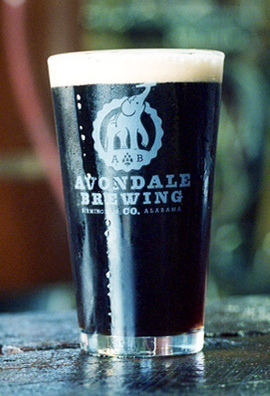 We drive around and park behind Avondale Brewery, thinking the walk will do us good, both coming and going. But, it is frigid cold and when we get to SAW’S and wiggle through the front door, I realize we may be standing for lunch. All the tables are full! I remember reading somewhere that because everything is prepared when it’s ordered that a short wait is to be expected. It works out well; by the time our food arrives we have claimed a table in the corner. Locals fill the place –you can tell by their demeanor that this is their local grazing hole. “Blues in the Night” plays on the radio. The laid back feel of the place worms its way into my psyche. Immediately, even before taking the first bite, I am hooked! “My mama done tol’ me when I was in pigtails, My mama done tol’ me, “Hon a man’s gonna sweet talk and give ya the big eye…” Ella belts out those lyrics like she knows. 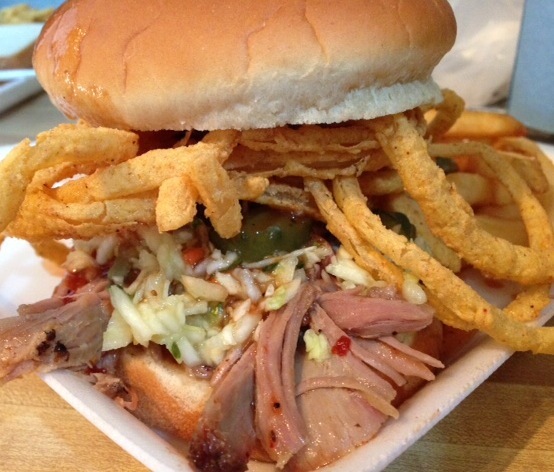 I order the Carolina Pulled Pork Sandwich topped with slaw and a pile of fried onion rings. My friends order the Carolina Burger. Lord what a burger! 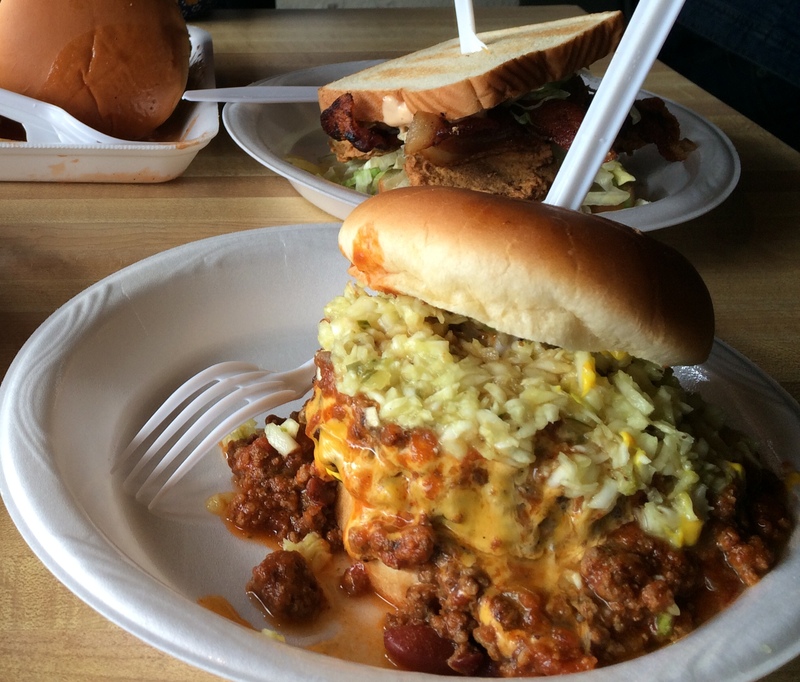 It arrives covered in chili and topped with slaw. It is unbelievable. I try a bite and really don’t want to hand it back over. 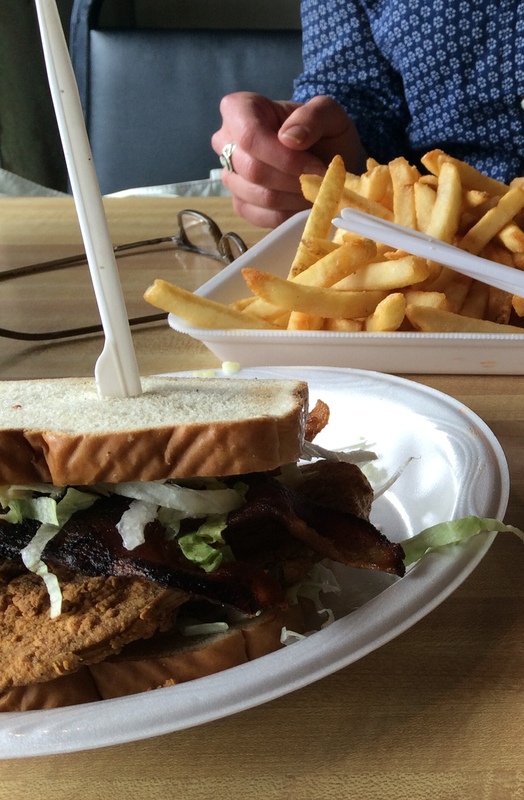 We foolishly order a Fried Green Tomato BLT too. It is good but I’m as funny about my fried green tomatoes as I am about my cowboy boots. 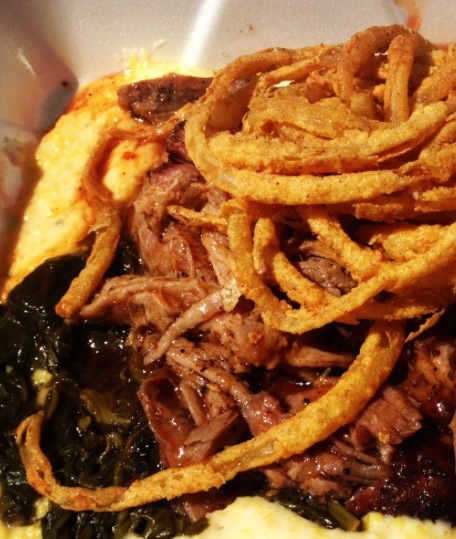 A man seated nearby is presented with a plate piled with cheese grits, greens and pulled pork. Again, I want another’s food. Thankfully, I am beyond full. I also pass on a deep bowl of Homemade Banana Pudding. Then comes the knowledge there is a cooler in my trunk… I could get a large container to go! Had it been warmer, we would’ve ordered our food and had it delivered to Avondale Brewery just a couple of doors down and eaten out back under the hardwood trees. We notice as we walk up that the back patio is deserted. 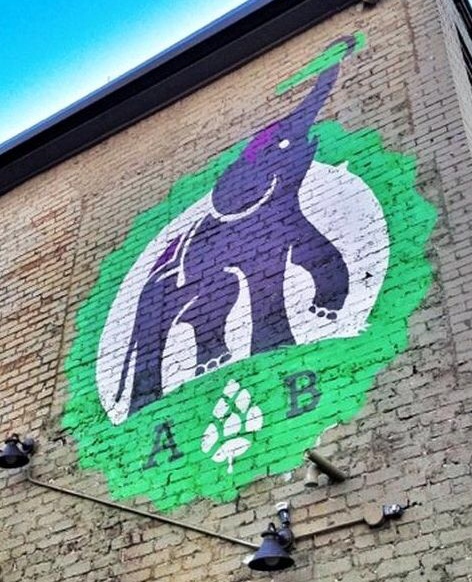 Miss Fancy the Elephant, the brewery’s mascot, was a gift bestowed to the city back when Avondale Park was the original site of the Birmingham Zoo. The offerings are: the Spring Street Saison, a “Belgian-style farmhouse ale; Miss Fancy’s Triple, a Belgian ale; Battlefield IPA “hoppy citrus and floral”; Vanillaphant Porter, a light-bodied ale with “chocolate, roasted nut flavors & a vanilla twist”; and Mr. Todd’s Brown, a dark ale (Just say, hell yes!). I know why I would live at the P.O. –because I am weak for wood-fired pizza! Remember now, I am a Gadsden girl and therefore my heart will always belong to MATER’S on 3rd & Locust when it comes to my favorite pies. But, this Swine Pie is something else! The crust is chewy, and while I like it this way too, I wish I’d asked for it to be charred. There is just something about the added smokiness when it is. 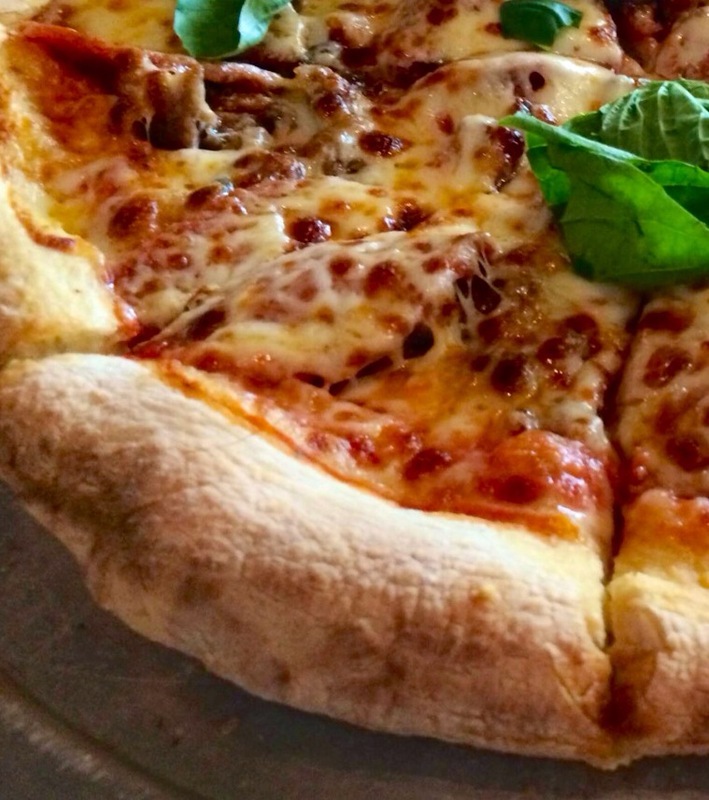 Top the crust with marinara, sausage (made in house), pepperoni, bacon and fresh basil leaves –Voila! Tell the world I am happy here at the P.O. seeking refuge, isolated and well fed.